the exception unknown software exception (0xc06d007f) occured in the application at location 0xfd0e940d. Please help, error when hit PLAY button. same error when hit PLAY without mod. Thank you for the report. There are no files in your dumps folder, seems like the game didn't even start to load. Do you have everything up-to-date? The Exception Unknown Software Exception 0xc06d007e error may be caused by windows system file damage. Run the Windows System File Check tool to repair corrupted system files. 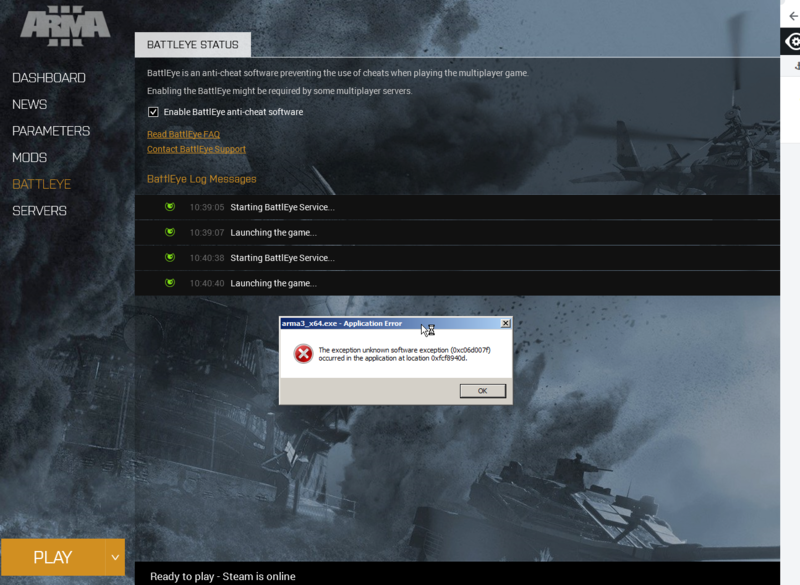 17/01/2019 9:14:01 - BattlEye: Note that file blocks can be ignored if they don't cause problems with the game. Have you tried launching the game with Dev branch selected? There was an issue that was similar to this, but it is a year and a half old, I'll give you the link to it, Here. Please let us know if the issue occurs in the dev branch. Also have you tried updating your graphics drivers? It might be related.